Hans Cottage Botel is one of most beautiful natural habitat that has been modified slightly to accomodate tourists. 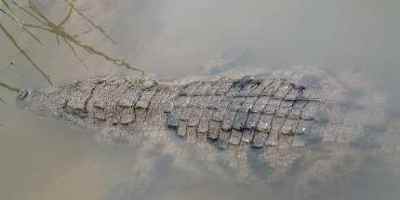 crocodiles, turtles and many species of birds. 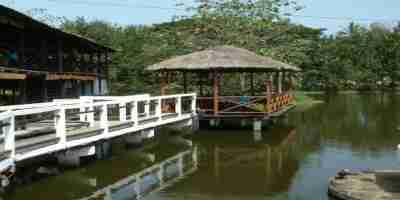 It is located only 6 kms from Cape Coast and 12 kms from the world famous Kakum Rain Forest National Park. The location makes it a very good "pit stop" for tourists on their way to or from the Kakum National Park to stop for refreshments or lodging. The Hans Cottage offers its guests a refreshingly different holiday experience. Eco-tourists will delight in the ambiance, and The Botel is the ideal location for visiting school groups, bird watching enthusiasts and tourists. flora of the rain forest in nearby Kakum National Park. Some of the services they provide include Bed and Breakfast and some amenities they can boast of include Tennis Court,Badminton Court, Pool Table and Darts Boards. Boating and Fishing is also available for water lovers. In terms of rooms, they have private and separate houses with bedrooms, living room, private baths and kitchen facilities. The houses are ideal for two couples or a family with children and the price is very affordable. The bar and restaurant is a popular spot for both visitors and locals alike. The menu features traditional Ghanaian dishes and Continental cuisine. Most of the vegetables they serve are grown organically right in the backyard garden so you get it served fresh. On weekend nights and Public Holidays, there's usually a live band to entertain guests. For breakfast and lunch , relax in any of the several restaurant areas for privacy or social interaction while you watch the resident crocodiles and birds. 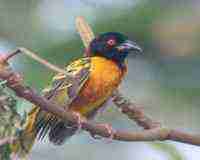 This place has been marked as one of the best places for bird watching. It is the home to many species of birds. In the evening you can enjoy the quiet solitude of the natural rural environment while you dine, sip cold drinks and watch beautiful birds "singing". You can always contact Us, to give your advice, suggestions, comments and anything you think will make this site a one stop for you and Ghana.